A wonderful & rare surviving example of a 'Le Strap Auto' folding chair. A very interesting piece of excellent form in wrought iron & original rexine upholstery, with a functional folding & locking mechanism & finished with a brass makers plaque. 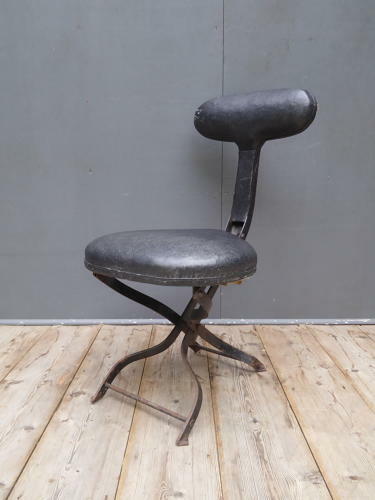 Manufactured during the boom of the early 20th century automotive accessories industry, the chair was designed to provide an extra seat between the two existing seats inside a vehicle & also a portable seat for picnicing etc on road trips. A fantastic example of a bygone era whih makes a charming & functional decorative piece. Seat height is around 30cm.